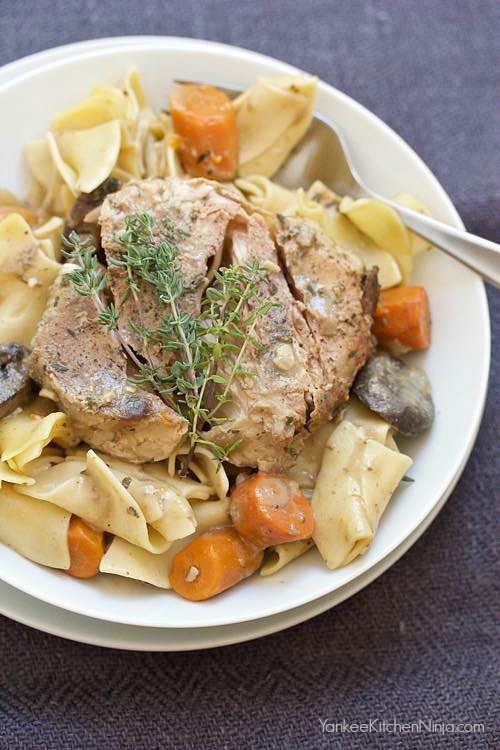 Creamy slow cooker pork and vegetables: easy weeknight comfort food that will make your whole house smell as good as dinner tastes. 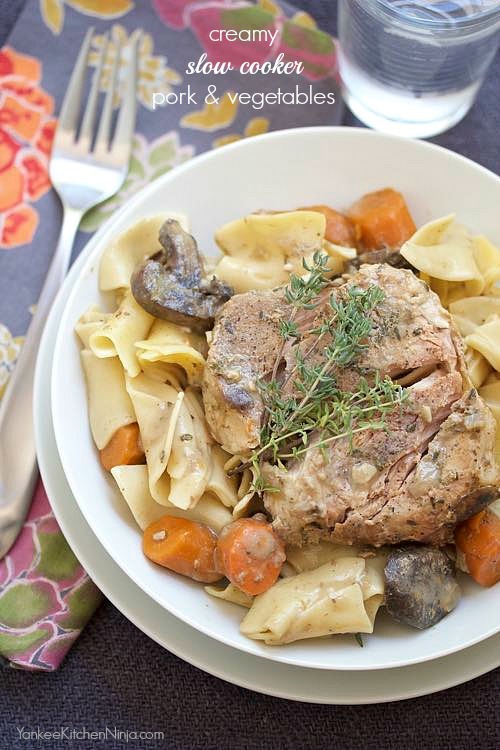 That song will be running through your head all day long as you smell this creamy slow cooker pork and vegetables dinner cooking. I speak from experience. And it wasn't just me. The first time I made this slow cooker recipe, a pair of HVAC guys were working upstairs in our house, installing a new air conditioning system. At the end of the day, one of the guys said to me, "Well, we have a little problem." I begin freaking out. You know, because I'm always so calm when problems arise (snort). "What's wrong?" He replied, "We really don't mind working hard all day. But you made it really, really hard today since you've made us smell something that delicious all day long!" I wish I could have given him a taste. He wouldn't have been disappointed. And neither will you. You know my specialty (only partly because I'm lazy) is easy, real-food weeknight dinners that anyone can make. I have to say, this slow cooker pork over noodles is one of the best of them, hands down. Throw it all in the crock and it's ready when you are. All you have to do is boil some egg noodles and you've got a complete dinner, just like that. Just try not to hang around the house while it's cooking or you'll be humming "Anticipation" all day long. What's your favorite makes-the-house-smell-so-good dinner recipe? Leave a comment: The Ninj wants to know. In the crock of a slow cooker coated with cooking spray, whisk together the stock, wine, vinegar and flour until blended. Add the carrots, mushrooms, onion, garlic, thyme and oregano and stir to coat. Season the pork chops with salt and pepper and nestle them in with the vegetables in the crock. Cover and cook on LOW for 6-7 hours or until the vegetables are tender. While cooking the egg noodles according to package directions, remove the pork chops from the crock, then stir the half and half into the vegetable mixture. Season to taste with additional salt and pepper. Divide the noodles among four bowls and top each with a pork chop and a spoonful of the saucy vegetable mixture. Sounds great! 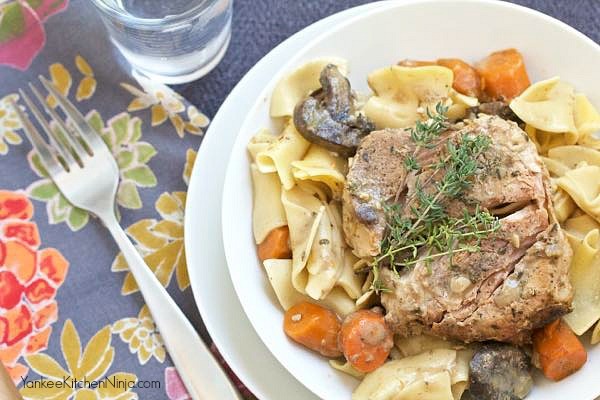 Will add it to my Sunday dinner repertoire!I love the aroma of Pot Roast in my dutch oven and use the recipe on the back of one of the Lipton beef onion packages. Hope you love this one, Pam -- and now it's time to give up those soup packets!! We adapted your Crockpot Turkey Chili with Butternut Squash and Apples as a vegetarian recipe. It's torture working from home as that fills the house with goodness.